The fascinating Maple Bluff mirage was photographed by Arlene Koziol on Monday, Dec 19, 2016. Arlene took the photo from Marshal Park, standing on the west shore of Lake Mendota and looking ENE across the lake to Maple Bluff, approximately 5 miles distant. It was a very cold day. The air temperature was -5F in the morning and climbed only to ‘single digits’ in the afternoon when this photo was taken. The coldest (most dense) air was at the surface. But something different occurred when this cold dense air was blown out over the still-unfrozen and much warmer lake water, 32-33F. The lowest layer of dense cold air was heated vigorously from below. This unique circumstance caused an unusual temperature stratification: warmed air at the lake surface, the coldest, densest air immediately above, and somewhat less cold air above that. This unusual ‘layering’ caused the light paths reaching our eye (the camera’s eye) from the distant Maple Bluff cliff to be abnormally curved. Read more about the density structure and refraction at the end of this note. In the mirage, the 60foot cliff and the homes above it are stretched vertically. The upper part of the cliff is stretched about 100%, i.e., twice as tall; the houses are stretched about 15%. Even more unsettling, while the upper part of the mirage cliff appears upright, it sits atop an inverted image (a mirror image) of itself! --- AND, the lower parts of the cliff and the shoreline are missing! The slight blurring in the mirage photo, compared to the normal photo, is caused by small turbulent eddies that are mixing the warm and cold air. Unbelievable? 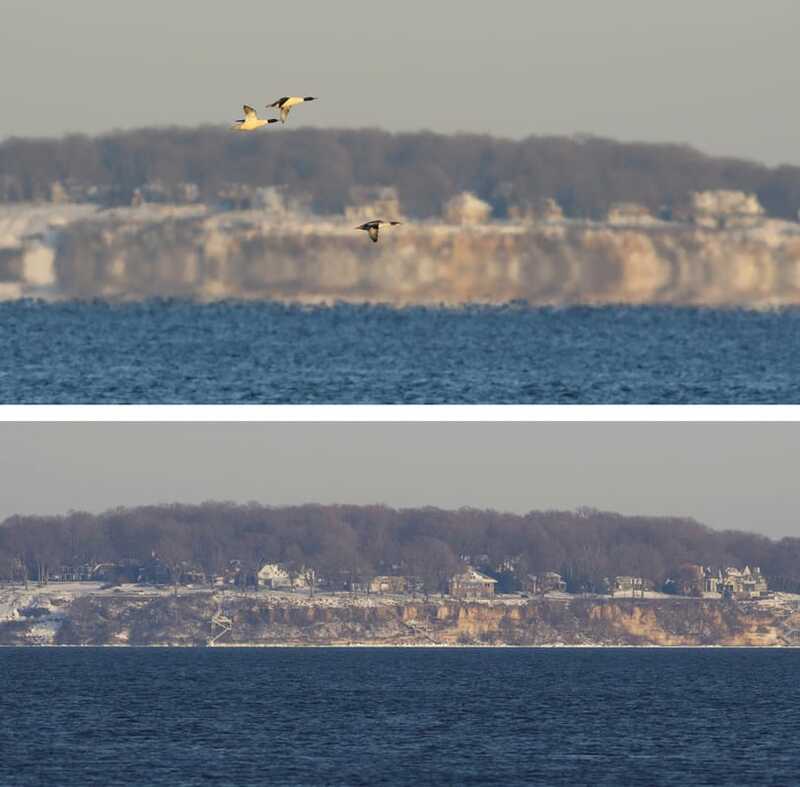 Compare the Mirage photo with the Normal photo of the Maple Bluff cliff taken from the same location but 3 days later when the air temperature and water temperature were the same, both around 32-33F, and light paths were ‘normal’. In the normal photo, the rock and vegetation features of the bottom half of the cliff, and the fringe of lake ice, look completely different than the rock and vegetation of the top half. These differences are NOT seen in the mirage photo. In the mirage – the bottom half of the cliff looks like the top half, but inverted. So, for example, near the right edge, one sees a bent line in the mirage photo - but the bottom half of the bend is just the mirrored image of a slant in the rock-vegetation border in the top half of the cliff! Discover other mirage effects yourself. What’s happening? In the mirage, the light paths coming from the upper part of the cliff are reaching our eyes along two arcs: one is concave, or bending downward toward the denser air - this gives the upright and stretched (superior) image; the other arc is convex, or bending upward toward the denser air - this gives the inverted (inferior) mirror image. The eye, or camera, sees both light paths at the same time. Moreover, the light paths from the bottom of the normal cliff are bent so much that we can’t see the real cliff bottom in the mirage photo! The odd-looking pointy-cusped wave tops are also a mirage. The light paths from the wave tops are curved upward so much that we are probably seeing waves that are relatively close to the camera, i.e., not waves at the far shore. We get the impression of big waves — because we think we are looking at waves a long way away and we compare their height to the scale of the cliff. We are tricked. Impressions! To me, Arlene’s photograph captures the mystic of mirage – the photo combines the somewhat unreal and blurry image of distant Maple Bluff with the sharp image of the common mergansers in the foreground. Mirages change as the light paths change – perhaps a photo taken early or later, or from a slightly different height – would be different. Keep watching, experimenting, and photographing. Going Deeper: Temperature and Density Structure, and Refraction. The cold air at the surface on the 19th, with warmer air above it, is the typical ‘inversion’ that forms on cold nights and persists during the day. In this case, however, when the cold air moved over the lake the very bottom layer just above the water was warmed, creating the unusual stratification mentioned above. The densest air was probably only several feet or at most tens of feet above the lake surface. This unusual density structure produced the vertical stretching and the superior and inferior mirages of the upper half of the Maple Bluff cliff. This schematic illustrates the refraction causing both the superior mirage and the inverted inferior mirage. However, in the Maple Bluff mirage the two mirages are joined and the bottom half of the real object is not visible. Compare the photos. 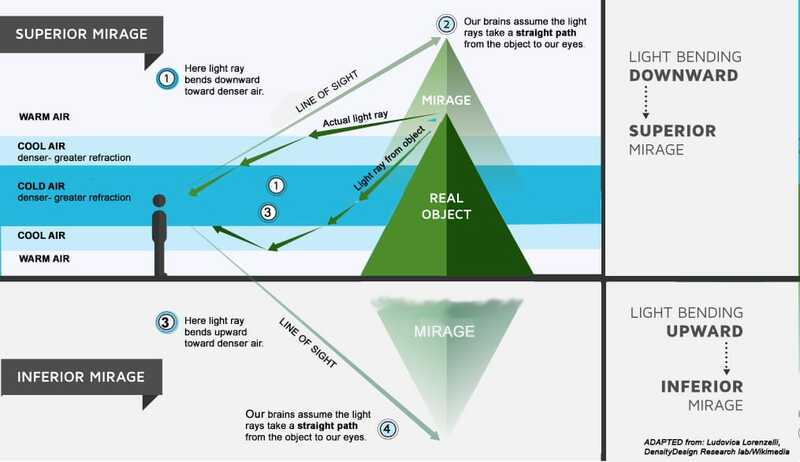 ​ Refraction phenomena and Mirages have been observed for centuries. A detailed scientific description of these phenomena is found in the now-classic scientific textbook written by W. J. Humphreys, “Physics of the Air.” The book was first published in 1920, almost a century ago; it has been reprinted many times. Humphreys, a physicist, was employed at the National Weather Bureau, a precursor to our modern national weather service. Descriptions of mirages are not only the province of physicists but of poets. Read the poem by Henry Wadsworth Longfellow, “ Fata Morgana,” published in 1873. Arlene Koziol and John Kutzbach, Madison, Wisconsin, 2016.